Have a minute? In 60 seconds – or less – you can practice yoga and gain significant and lasting benefits. 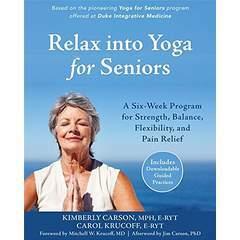 This book is filled with quick, simple “micro-practices” designed to help you integrate powerful yogic teachings into your daily life. And they are accessible to virtually anyone—regardless of age or fitness level. 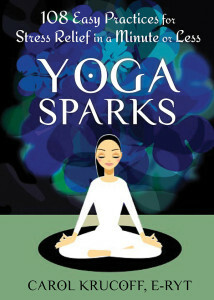 If you can breathe, you can do Yoga Sparks. No need for a yoga mat or special clothing. Because despite the common misconception that yoga is primarily a form of physical exercise, this ancient discipline is actually a practice of awareness designed to quiet your mind and help you connect with your true self. That’s why each Yoga Spark is geared to enhancing your awareness—bringing you into the present moment and helping you find ease in your body, mind and spirit. Some Yoga Sparks primarily impact your muscles and bones, others center on your thoughts and attitudes, and still others address your behaviors and breathing. Over time, these micro-practices can have major effects: from relieving pain and stress, to stretching and strengthening your body, calming your mind and lifting your spirits. Fit them into activities you’re already doing–such as showering, cooking, and surfing the ‘Net—to help cultivate ease, joy and well being. In the midst of our busy, stressful lives, Yoga Sparks can become transformative moments. It is my sincere hope that you’ll find these practice “flashes” so useful that they become welcome habits, igniting the myriad benefits of this profoundly healing discipline into your life. Publication date, August 1, 2013.